I’ve looked into this year’s district health board candidates to help you keep quacks off your DHB this election. Unless you live in Southland, this year you probably get to vote for several spots on your local district health board. With the move to DHBs making decisions about water fluoridation, there’s a danger that some of the candidates standing could be anti-fluoride or worse. And if they’re crafty, they likely won’t make that clear in their candidate profile that you get in the post with your voting papers. Over the past week or so, I’ve looked through all the profiles for DHB candidates throughout the country, and followed up on anything that looked like a red flag for quackery. While many candidates looked great, I also found some that you probably don’t want to vote for such as a homeopath who’s been censured for false advertising, someone who promotes detox diets through her business and claims they can cure allergies and other diseases, and a chiropractor who claims to treat babies for colic. And that’s just the tip of the iceberg. We’re also lucky that the anti-fluoride lobby group Fluoride Free New Zealand has published a survey with responses from many council and DHB candidates regarding their thoughts on fluoride. It’s very kind of them to have spared a thought for sceptics and published such a useful resource. 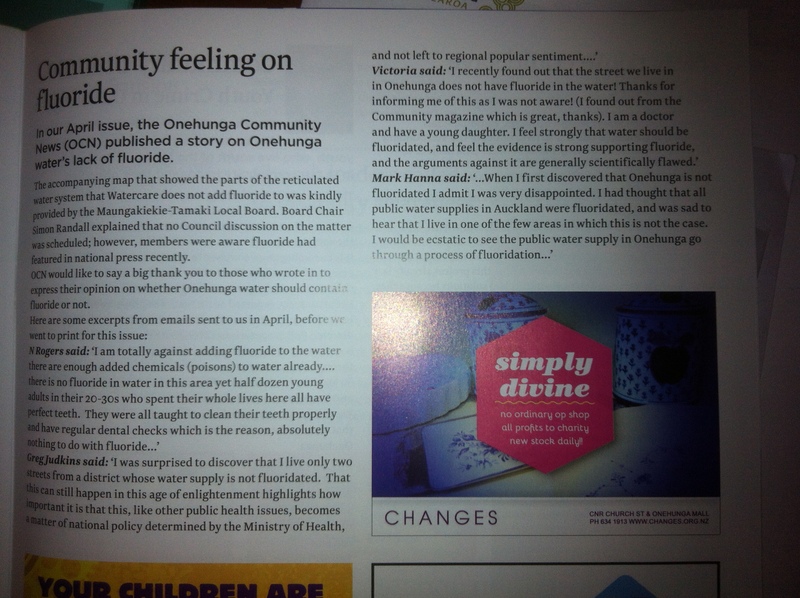 In last month’s issue of my local community newsletter, Onehunga Community News, an article was published about water fluoridation. For those of you who are non-locals, Onehunga is a suburb of Auckland, and in general drinking water in Auckland is fluoridated. Click to view the full image and read the article. The article mentioned some of the recent national news about fluoridation, which I won’t get into here, and used it to bring up the fact that much of Onehunga’s water is not fluoridated. It gave links to the Ministry of Health for pro-fluoridation information and Fluoride Action Network New Zealand (FANNZ) for anti-fluoridation information, and it called for readers to send in their thoughts. I was rather disappointed to see the article “To fluoridate or not to fluoridate…” mention the anti-fluoride group “Fluoride Action Network New Zealand” as though it were a reputable source of information on fluoride. This group relies largely on scare-tactics and misinformation, driven by ideology rather than evidence. In comparison, the Ministry of Health is driven by the available to evidence to find the best conclusion, which it believes is that fluoridating the public water supply is an effective, safe, and cost-effective way of improving dental health. The Ministry of Health website has a page listing a number of websites that provide accurate information on water fluoridation. The FANNZ site is not on this list. That is not simply because FANNZ disagrees with the Ministry of Health on this issue, it is because FANNZ is not a reliable or trustworthy science-based source of unbiased information on this issue. 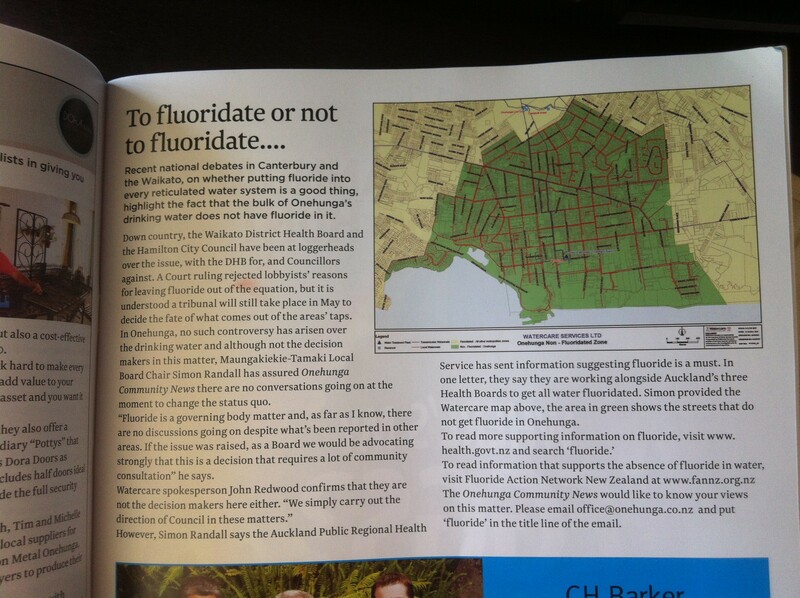 When I first discovered that Onehunga is not fluoridated I admit I was very disappointed. I had thought that all public water supplies in Auckland were fluoridated, and was sad to hear that I lived in one of the few areas in which this is not the case. I would be ecstatic to see the public water supply in Onehunga go through a process of fluoridation. It is worth noting that the process of fluoridation is not necessarily as simple as adding fluoride to the water – it is ensuring that the levels fall within a particular range. As some locations have high natural levels of fluoride, this process can involve the lowering of fluoride levels in order to ensure it is maintained at a concentration that is safe and effective. According to data from the New Zealand Institute of Chemistry (the data are from 1995, but I’m not aware of any more recent data. I have no particular reason to expect a large change since that date though) the level of fluoride in Onehunga drinking water is around 0.15-0.16 mg/L. In comparison, the fluoride level in Ardmore drinking water was increased from 0.04 mg/L to 0.86 mg/L. Onehunga water did have substantially higher natural levels of fluoride than that of the other Auckland areas sampled, but the final level after treatment was also significantly lower than those areas in which the water was fluoridated. Water fluoridation to prevent dental caries is akin to the fortification of bread with folic acid to prevent neural tube defects in children, or iodine in table salt to prevent iodine deficiency. These are all safe and effective science-based preventive methods that improve public health. I understand the journalistic urge to provide balance on all issues, but it is important not to establish a false balance such as this. This is a topic on which it is important to listen to the experts. The editor responded to defend their approach to pursue balance by saying that they shouldn’t only provide government resources. I didn’t find it convincing, but I do understand somewhat the urge for journalists to provide both sides of every story. There is some merit in that but, as I said in my message quoted above, it is possible to take it too far. It feels relevant to note that, since I sent this message, 3 separate ASA complaints have been upheld against FANNZ on the basis that they failed to adequately distinguish opinion from fact. I wouldn’t be surprised to see a couple more in the future either. When it comes to the fluoride debate there is a lot of misinformation out there, so you have to be extra careful that you’re getting yours from a reliable source. FANNZ is not a reliable source of information. The Ministry of Health is, and if you want a non-governmental source then you might want to check out Making Sense of Fluoride. For the sake of full disclosure, I’m Facebook friends with some of the people in charge of Making Sense of Fluoride, and gave some advice on the ASA complaints submitted against FANNZ when they were being written.